Vivekananda Kendra Kanyakumari, Br. Chinchwad had organized a small session for the MPSC students of More College Akurdi, wherein Shri Vishwasji guided the students on basic problems like concentration, social responsibility etc. He stressed upon the importance of Yoga especially the Ashtang Yoga - Yam/Niyam to help improve the concentration of the students, to help them being a better human being. He stressed upon the fact of Goal setting withut which one cannot go ahead in life. He explaind the significance to the UB day celebration, the importance of looking everyone as our brethren was the message Swami Vivekananda had stressed upon in 1893. In evening we had arranged a lecture of Shri Vishwasji which was an open program attended by the students of various colleges around PCMC area. 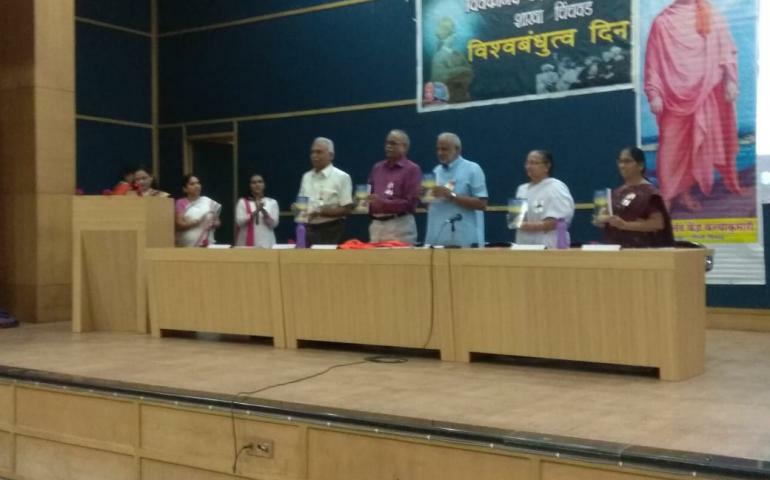 Chief guest of the program Dr. Girish Afale, Jilha Sangh Chalak were present for the book publication ceremony of our book Seva Samarpan. Shri Jayant Kulkarni - Pune branch Sanchalak, Mrs. Vasudhatai Karandikar - VKMPV Head, Shrimati Arunatai Marathe - Sanyojak, Mrs Mugdhatai Sardeshpande and volunteers of our branch were present for the celebrations of this day. One of the stories Shri Vishwasji had narrated touched everyone. He told about the strike called in Japan last month. Many students/people were stranded as they had no idea if the public transport would be available to them to go to work/school. But to their uproise the buses arrived on time. On asking the conductor his reply was very thought provoking. He said that if they would not have come today then many people would not be able to go to work or to schools which in turn would result in heavy loss to the nation, so the came today, but to support the strike they did not charge tickets for any passenger. A thought just struck in my mind that what if the people in India had thought like this on the strike called on Monday 10th September where there were huge losses due to it financially as well as because of damage to public property by some hooligans. Everyone has to think beyond the individual self, Nation first should be the highest ideology for everyone. One should always think for the good of others. Swami Vivekananda had always dreamed of our motherland with all the people helping her to regain the lost glory. We all should ponder on this thought and thrive to achieve this goal.